Dictators love the movies. Francisco Franco of Spain was no exception. (The propaganda picture Raza, from 1942, is even based on a novel written by Franco.) 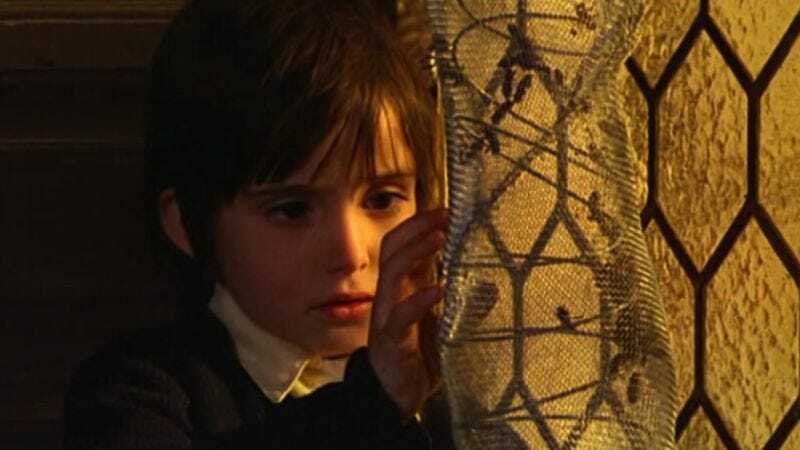 Subtlety, however, often jams the radar of even the most suspicious despot, which may explain how the ghostly parable The Spirit Of The Beehive made it into theaters in 1973, at the tail end of Franco’s regime. Set in 1940, the film is a condemnation and an elegy, a lament for Spain after the Civil War that brought Franco to power. It’s also a deeply moving tribute to the eager inquisitiveness of children and the magic of movies. After the screening, Ana becomes obsessed and hounds her older sister Isabel (Isabel Tellería), in an exchange of eerie whispers, about the “the monster.” Just to get her to bed, Isabel tells Ana: “Everything in the movies is fake. It’s all a trick.” Isabel then claims Frankenstein was not killed and that she has seen the monster alive in a nearby village. Accordingly, Ana embarks on a secret search in which she stumbles across a wounded soldier presumably AWOL from the frontlines, hiding out in an abandoned building surrounded by a bleak, brown landscape. Ana returns with food—cautious and suspicious, as if this might actually be the monster. What follows is scene after scene of breathtaking beauty that any student of cinematography should decode and steal from freely. There are bees, magic mushrooms, slow motion, and a Frankenstein cameo that almost ended up on the cutting room floor. The enduring mystique of The Spirit Of The Beehive, now nearly 40 years old, seems to have spread beyond the frame lines. Víctor Erice has directed only two features since. Cinematographer Luis Cuadrado went blind after Beehive wrapped, and he committed suicide seven years later. And even after a slew of other screen appearances, Torrent remains perhaps best known as the young star of this miraculous movie. But is Franco the monster? Four decades removed from its original context, the question no longer seems pressing. Availability: Spirit Of The Beehive is available on Criterion DVD, which can be obtained through Netflix, and to stream on Hulu Plus.